Update, Oct. 11, 2016: Tracking data show that Phyllis is close to half-way back to the west coast of North America, presumably Año Nuevo Reserve, after her journey almost to Japan. She's traveled roughly 10,000 kilometers so far and is expected to have covered 12,000 km by the time she arrives in January. Two days after Phyllis Sooy died from colon cancer at age 75, her husband, Steve, found an email in his inbox. The note was from Marcus Frost, new director of development for coastal sustainability at UC Santa Cruz, and said researchers at the campus’s Costa Lab had named two satellite-tagged northern elephant seals after Steve and Phyllis in thanks for a $200,000 graduate fellowship endowment Steve had established earlier. 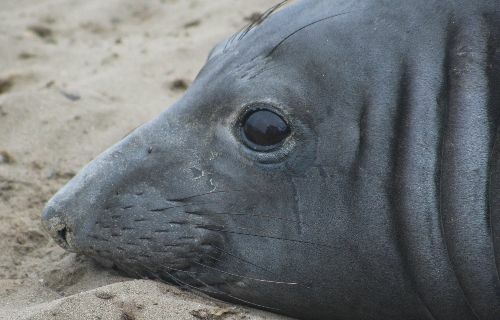 During the seals’ annual eight-month migration, Phyllis, an 853-pound mother of two, set a record by swimming farther west than any other tracked elephant seal. Researchers at the lab run by Professor of Ecology and Evolutionary Biology Dan Costa have been tracking them for 22 years, according to Patrick Robinson, director of the Año Nuevo Reserve. Swimming nearly to Japan, the seven-year-old Phyllis covered just shy of 6,000 km, or about 3,700 miles, of ocean before turning around and heading for home. The average distance northern elephant seals usually swim during their eight-month migration is 3,257 km or about 2,023 miles, Robinson said. By the time Phyllis the seal arrives back in California in January, she will have recorded a flipper-tiring 12,000-km, or 7,400-mile, foraging adventure. 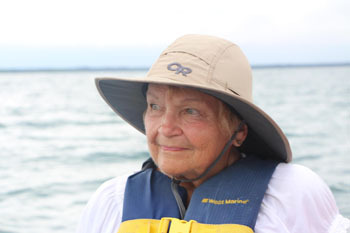 Before her death, Phyllis Sooy was a newspaper reporter and later a food service broker. She first met Steve through his late-wife, Rebecca, who was her college roommate. Phyllis was married to her high school sweetheart. When Rebecca Sooy died of colon cancer in 2005, Phyllis — also a widow now — invited Steve to spend Christmas with her family. “We realized it was more than friendship,” Steve said. Theirs became a household brimming with people: seven children, eighteen grandchildren and assorted guests. Each winter for six years, Phyllis and Steve also would drive cross-country to visit their children before settling in Pescadero near UC’s Año Nuevo Reserve where Steve volunteered as a docent, regaling visitors with stories of northern elephant seals’ remarkable return from near extinction when humans, in search of lamp oil, killed the marine mammals by the thousands. The reserve is also where graduate and undergraduate researchers from UC Santa Cruz are working not only to unlock the secrets of these amazing animals and the ocean where they swim but have compiled what is arguably the largest marine mammal diving and tracking record on the planet, according to Robinson, who got his Ph.D. at UC Santa Cruz. After Phyllis died, Steve said, he found it fun to track the flipper-equipped Phyllis across the ocean and tell people how it made sense that her namesake seal was a fast swimmer since Phyllis his wife always drove too fast. This winter, he plans to once again drive across the country for his docent duties at Año Nuevo and hopes to be there to meet Phyllis the seal when she lumbers ashore in January. UC Santa Cruz’s Robinson said he’s happy to help out. “We’re going to make a special effort to find Phyllis for Steve,” he said.